Many startup companies invent new markets or approaches to solving existing problems. In doing so, they need to convince their markets to think differently about this brand-new approach to industry problems. This is very difficult and requires a non-traditional sales approach. These opportunities are Blue Ocean opportunities and they require Blue Ocean knowledge, a Blue Ocean approach and Blue Ocean sales people which is not a strength of most traditional sales people. Part of the challenge is making sure that, as an entrepreneur, you don’t hire sales people who can only sell in red oceans (commodities) or in markets where the buying-decision rules are already established. These red ocean people know how best to compete within existing boundaries. This never works with Blue Ocean opportunities. And, this may often be why only the founder or the founding team can sell the product. Since only the founder (and/or the founding team) fully appreciates the change required in the buying criteria and the value created by the new product, they can get prospective customers to think differently while red ocean sales people that they hire do not. The fundamental challenge is to begin the sales hiring process with Blue Ocean sales people who can then leverage their knowledge and experience to other newer sales people. Beginning with red ocean sales people leads to frustration and creates doubt in the founder’s mind about the viability of the opportunity. It also creates issues with investors. Remember that red ocean sales people will not succeed in Blue Ocean companies. It requires a different mentality and different skill set. Many founders don’t even understand Blue Ocean Strategy, have not read the books and therefore do not understand the problem that their companies have creating uncontested market space. They also do not have experience hiring sales people in general, let alone Blue Ocean sales people. Ability to understand and counter cognitive, motivational, resources, political, feature and risk objections. This requires planning and pre-emptive strike on known objections in all categories. Unwavering belief in Blue Ocean concepts and the ability to quickly walk away from prospects who are industry laggards and refuse to accept new buying criteria. Blue Ocean sales people will begin by uncovering market pain and helping buyers understand why buying decisions need to change in order to solve the pain. They focus on why their company exists and what pain points the company is trying to address and get buyers to agree on those pain points. Then, they will focus on features, benefits and uses. They will take maximum advantage of customer references and make sure that references help to change prospects buying criteria. This is a different reference approach than a classic approach of “Yes, things went smoothly”. Blue Ocean companies write more detailed case studies that focus on why buyers bought the product. They don’t settle for short 2-paragraph case studies that ignore the most important parts of the process. Blue Ocean sales people do not respond to RFP’s they create RFPs. Blue Ocean sales people help their internal champion sell the product internally understanding that decision makers who were not involved in the evaluation process will be confused by the new criteria. Blue Ocean sales people do not just try to exploit existing demand, they create new demand by turning buyer’s latent pain to pain. This means that they help buyers understand that they have a problem, that can be solved but with a new, different and better approach. They clearly articulate problems and solutions that the buyer may not have seen on their own and convince buyers to think about solutions from a different perspective. They do not fall into the trap of allowing the buyers to use traditional methods for choosing a solution. This requires extra effort that most sales people will not put in. Blue Ocean sales people understand that buyers hate risk and do not necessarily like change. Change implies risk. It also implies a change to workflow, job functions and other things that many buyers would rather not deal with. So, if this is a new approach that will interrupt the existing processes and procedure, the value of this needs to be properly sold and risk needs to be mitigated. Also, buyers will be confused if they are looking at four or five alternatives and all but one of them are basically the same and pushing a very similar buying criteria and one is selling something very different. While many sales people think this is good, if not properly explained it can cause confusion and create risk for the buyer. Interviewing and hiring Blue Ocean sales people is not easy. Founders who have never hired sales people before are normally woefully ill-equipped for this task. They simply do not know how to interview sales people, in general and therefore are at a total loss for interviewing blue ocean sales people. But this is what they require for sales success and scale. Did you read the Blue Ocean books? How would you sell a product that is unique? Have you ever sold a completely unique product in a market before? How do you handle objections? What kinds of objections do you expect and plan for? Are you more comfortable in a market with known competitors where the buying criteria is established or one where you can create the buying criteria? Why? How do you educate potential buyers? How do you demo products? In summary, there are two fundamental challenges that need to be addressed in Blue Ocean sales. One is a recognition by founders that sales people are not generic. Red Ocean sales people will very rarely be successful in Blue Ocean opportunities. Their skill set is to compete based on a given set of decision criteria. 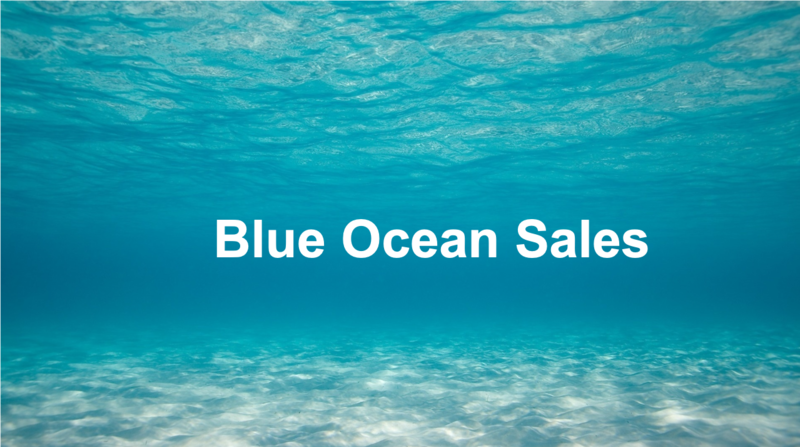 Blue Ocean sales people change that criteria. Second, and equally important is for founders themselves to understand the concepts behind Blue Ocean strategy. The company simply cannot execute Blue Ocean strategy, Blue Ocean marketing or Blue Ocean sales if the founder/CEO does not fully understand Blue Ocean principles. Founders often unconsciously use Blue Ocean principles in early sales but do not know how to translate that to the sales people they bring in to scale their company. To learn more about implementing a Blue Ocean sales approach, write to arbordakota@me.com. We are experts and creating and exploiting uncontested market spaces.